Bangkok Smile MALO CLINIC is an award-winning dental clinic since 2003. 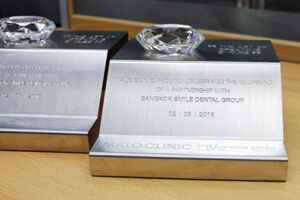 Bangkok Smile MALO CLINIC have gained numerous recognitions and awards from distinctive companies around the world, on top of being the one and only dental group to achieve an ISO 9001:2008 Certification by the Bureau Veritas for both our dental clinics and dental lab. 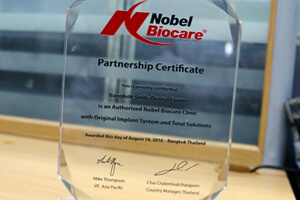 The latest addition is our partnership with MALO CLINIC Worldwide and our Nobel Biocare Authorized Clinic Award. At Bangkok Smile MALO CLINIC, we take pride in being a premier provider of Opalescence® Whitening Systems by Ultradent USA for many years now, because we only want our patients to receive top-quality products when it comes to improving their smiles. Ultradent is an international dental manufacturing company that has experienced non-stop growth for over 30 years, and is driven for continued growth. Ultradent’s products are used worldwide by dentists, orthodontists, group practices, dental labs, government agencies, and universities. 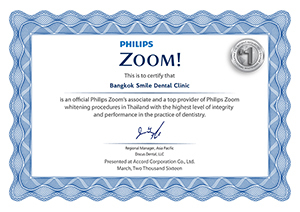 Congratulations to Bangkok Smile MALO CLINIC for obtaining yet another prestigious award; the #1 Provider for Teeth Whitening Services by Philips ZOOM! Whitening Systems for the year 2016. The Philips ZOOM! Teeth Whitening System is fast-becoming the standard and most popular procedure in Thailand. As such, we have truly proud achieved this award for it ensures our patients that the results we deliver are truly satisfying and of the highest standard when it comes to teeth whitening as well as with all the treatments we are offering them. Bangkok Smile MALO CLINIC is one of the few Certified DURAthin Providers in Thailand. We are truly proud in being able to provide our clients with such an advanced veneering technology which features contact lens-thin procelain veneers that are beautifully thin and remarkably durable. Astra Tech is a company in the AstraZeneca Group, one of the world’s leading medical & pharmaceutical companies. Astra Tech is divided into four business areas, where Astra Tech Dental is the fastest growing. They focus on advanced research and development in the field of implant dentistry. Their own implant system, Astra Tech Implant System is among the most thoroughly documented implant system on the market today. It combines function, beauty and biology in perfect harmony, which is known as the Astra Tech Bio-Management Complex. The numbers of implant practices that have reached a “Platinum” level of partnership with Astra Tech are very few. Platinum partners generally have greater and more immediate access to any number of cutting edge technologies and products, compared to practices that have a lower frequency of implant surgery cases. Bangkok Smile Dental Group has been has achieved and a high level of trust and confidence among local and international patients in providing Astra Tech dental implants. Bangkok Smile Dental Specialists have achieved a high level of expertise with Astra Tech dental implants due to high rate of usage and frequency. 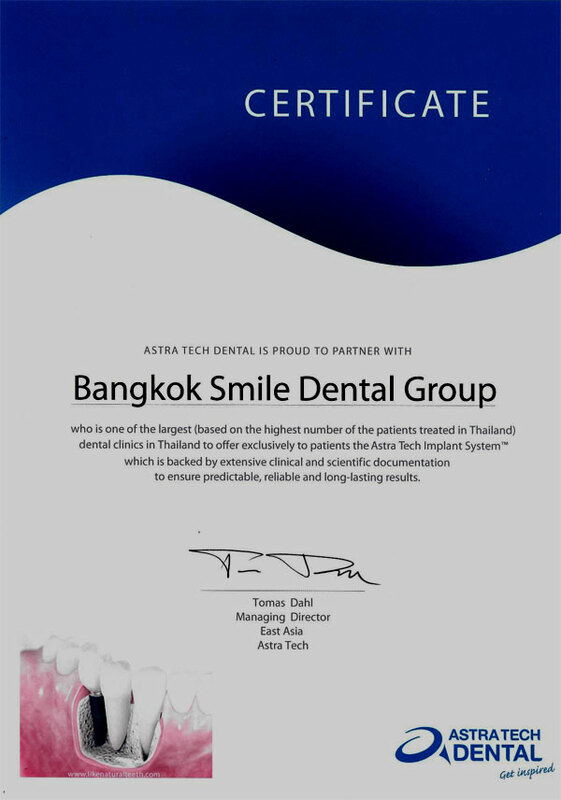 It is not unusual that many informed and educated patients to seek out the best clinics that have a strong track record and a long history of usage of Astra Tech for their complex reconstructive and rehabilitative surgeries thus relying on Bangkok Smile Dental Group to become their provider of choice for their dental implant treatment. Owning our success to the numerous clients who patronize our dental service, and the various recognitions that were awarded to us, rest assured you are only getting quality service and treatments Bangkok Smile MALO CLINIC.